Presentations don’t just communicate an idea, but also help start conversations and build relationships. To deliver a good presentation, you need to realize that presentation skills are as important as the information being presented. And remember, it’s not always the facts that sell; it’s more likely the presentation. Below are some useful tips to power up your presentation and gear up that presenter persona in you! Good presentations come from good preparation. Great presenters not only prepare, but practice a lot. Plan ahead and prepare your information with the visuals to go along with it. Researching on your audience will help you present in ways that target their interests. 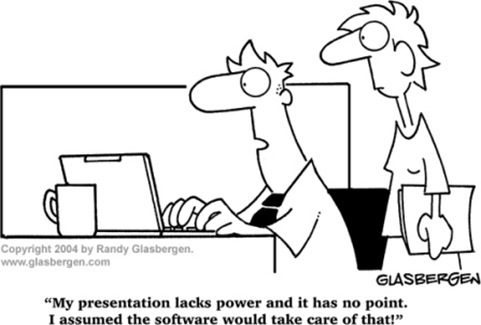 So what makes a presentation work? It’s simple – you have to make sure it never gets boring. So try to make the best use of your time and space. In your notes, only write down key points that you wish to elaborate while presenting. Unless you want your audience to sleep, don’t read from the paper or notes, it’ll only make you sound monotone and boring. Be entertaining and informative, instead of reciting facts. Practise makes perfect is the mantra here, practice out vocally and loud as much as you can, but don’t memorize. Rehearsing and memorizing are two different things. People love to listen to presenters who are engaging and interesting. Hooking the listeners with an effective opening that creates an emotional relationship will increase your chances of success in giving a great presentation. A good idea is to start your presentation with something light-hearted, like a funny story. During my days in design school, there was this one lecturer who made self-deprecating jokes while presenting, but believe it or not, we loved attending his lectures! No, we’re not suggesting you to do the same (though it works!) but being an entertaining speaker is an added advantage. Another way to gain the attention of your listeners is to outline what you are going to talk about, why and what are your aims and objectives. 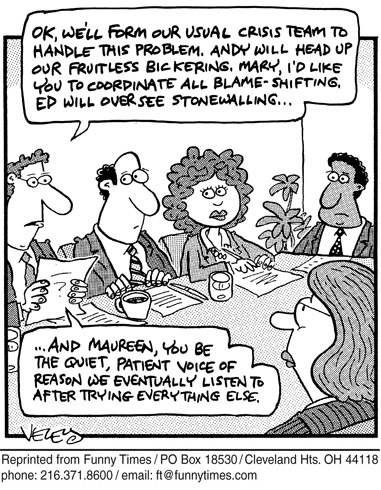 In presentations, the tone of voice matters. Project your voice to all corners of the room with confidence. Be loud and clear. Don’t use words like ‘’um’’, ‘’ah’’ or ‘’you know’’. In addition, speak slower than you normally do – this makes it audible and easier for listeners to digest what you are saying and also gives them time to think and reflect! Studies show that chances of attitude change are higher when the presenter is emotionally aroused and enthusiastic about the material they deliver. Here’s a tip for that, try to practise talking like your favourite entertainment personality. Visuals are important if you wish to create an impact in your presentation. They illustrate and emphasize your ideas. They help focus attention and make your presentation livelier. Besides visual aids, colour, balance, contrast and use of repetition can make your presentation more interesting. This won’t go wrong, we all love pictures! Some of the world’s famous presenters have freely admitted to nervousness and stage fright. Mark Twain said ‘’There are two types of speakers; those that are nervous and those that are liars’. Even experienced speakers tend to have presentation anxiety. While it’s normal to feel nervous before presenting, this can be disruptive to your continuity. The best way to combat nervousness is practice, practice and more practice. Mike Aguilera, a communication expert suggests changing the word ‘presentation’ to ‘conversation’ to ease off things. Turn that nervousness into positive energy. Consider your presentation to be a normal conversation than a ‘formal’ speech. And don’t worry, with experience, you build confidence, and with time, your levels of anxiety will decrease. Be patient and don’t let go of any presentation opportunities that come your way. And finally, it’s important to enjoy your presentation. Presenting with passion will motivate your audience to learn and listen, and ask questions. Here’s wishing you a killer presentation!! Injecting humour in your speech is a great way to wake up the audience to the sound of your voice! We’ve all been there at one time or another, suffering through a droning presentation, daydreaming about some fantasy island, basking in the sun …. but I digress! 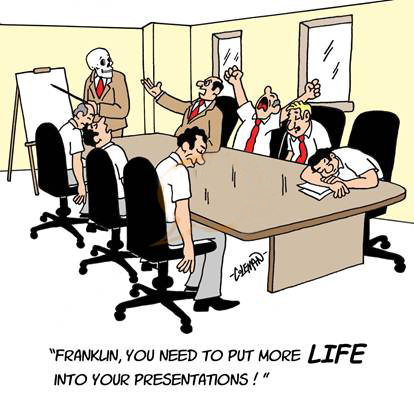 I know of people who’ve even snored through presentations and who can blame them! Humour can be valuable tool in public speaking. Adding a dash of humour here and there can spice up your presentation. Appropriate humour relaxes an audience and makes them feel more comfortable with you as the speaker; humour can bring attention to the point you are making; and humour will help the audience better remember your point. It can break down barriers so that your audience is more receptive to your ideas. Incorporating humour into a presentation doesn’t mean you take your audience or the topic lightly – it just means you’re skilled in effective communications, and you know and respect your audience enough to want to give a memorable presentation. Humour is an easy game to play – all you need is practice. The best and most comfortable place to start is to draw from your personal experience. Think back to an embarrassing moment in your life – while it may not have been funny at the time, it’s likely that you would have grown from the experience and can laugh about it now. Think about the punch line and use it in your speech. If you’re still uncomfortable or unsure about using humour in your presentations, fret not – here are some tips to get you started. The first step is to feel confident in yourself. Self-confidence is key to contemplating yourself successfully at the stage. Confidence is vital to deliver the desired and natural humour so the public explodes in laughter. Create your speech first, then think about the humour. If you try and be funny first, before getting your message clarified, you can run aground. You’ll spend more time worrying about how to be humorous rather than focusing on your message. Test your speech with a small group of people. Don’t get discouraged – sometimes it’s not about the humour, it’s the delivery. Pace yourself, speak clearly and aim to deliver the punch line at the right time. I’ve changed the timing of my punch lines on occasion. I would study the audience before my presentation, and strike a conversation with an audience member while on stage – drawing him/her to a joke I’m sharing, at times with hilarious results. This not only gets the attention of the audience but also engages them and it lightens the atmosphere. When making a presentation, you generally make your point through the use of presentation tools like powerpoint – don’t be afraid to incorporate funny graphics, captions or cartoon clips. Remember, the aim is not to be a standup comic. Graphics and cartoon images make it easy for your audience to pay attention, relate and remember your point. While everyone loves a good laugh humour can be risky because a poorly placed comment that you intended to be funny could backfire on you. One way to avoid this is to ask the hosts if there are any topics that are off limits. Make sure the humour relates to the point you’re making. Don’t use humour that is simply there to make the audience laugh. The humour should tie in with some aspect of your speech. For e.g., I was once speaking at a seminar about physical activity – I talked about myself being accident-prone, always tripping on shoe laces and publicly pledged my undying gratitude to shoemakers who revolutionized the world with Velcro for sports shoes! The audience laughed (presumably from visualizing my falling flat on my face! ), but more importantly they remembered the point I was making about the importance physical activity in our daily lives. You have to tie in appropriate humour with your presentation – so that the audience goes home with your key takeaway messages. It doesn’t matter which of the many available devices you use to inject humour as long as they’re in good taste, relevant to your presentation and your audience, and help to illustrate or convey a key point. A good point to note is make sure the humour you use is funny to you. If it doesn’t get you laughing then you cannot expect the audience to do so. You want them to laugh with you, not at you!